This is a personal favorite recipe of mine. 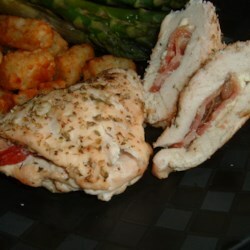 The chicken is moist, and the feta cheese and bacon inside are an amazing touch. The flavors all combine to create an amazing dish. Couple this entree with a side of green beans sauteed with diced onions, and some buttery mashed potatoes, and you’ve got a gourmet meal that is great for any occasion. With the Spring season upon us, I thought I’d post a list of what produce is fresh and when for those of you who enjoy eating and cooking great food with the freshest of ingredients. The spring and earlier summer is the best time to make some of the most delicious and fresh vegetable and fruit dishes imaginable. The below information is courtesy of Ceres Secrets. For last week’s recipe, I posted a wonderful corned beef & cabbage recipe just in time for St. Patricks day. Chances are, you may still have some of that deliciously tender corned beef left over. If that is indeed the case, look no further than this recipe for a way to use it up and enjoy it a second time! In homage to the upcoming St. Patrick’s Day holiday, I decided to post an great tasting recipe that seems to be synonymous with St. Patrick’s Day and Irish culture in America. This recipe is VERY easy, but you have to allow yourself time… as it requires slow cooking for several hours. The finished product is absolutely delicious, and is one of my favorite things to eat. You really can’t go wrong with meat and potatoes on a day like St. Paddy’s Day! Enjoy! This is a match made in heaven. For anyone that enjoys burgers, and enjoys breakfast foods, this recipe is for you. This burger is an absolutely delicious and gormet way of enjoying one of America’s favorite summertime (or anytime) foods. Just prepare these burgers and listen to people rave about how delicious they are. Now, I’m a very big fan of your typical bacon-cheeseburger, but this recipe will seriously change your whole perspective of what a burger is and what it can be. Enjoy! This week’s recipe is a Filet Mignon with rich balsamic glaze. It’s an absolutely scrumptious dish for anyone looking to serve themselves (or others) to a delicious entree. With March 14th fast approaching (guys you should know the significance of this date), there isn’t a better way to celebrate man’s favorite holiday than this dish. I’m not talking about a Philly Cheese steak here, because some people prefer to use that term in reference to a very specific recipe… and to be quite honest, I think some of the best cheese steak sandwich recipes these days don’t even find their origins in Philadelphia. 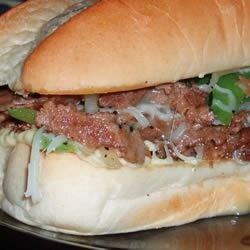 So anyways… scroll down for an absolutely delicious cheese steak sandwich recipe.